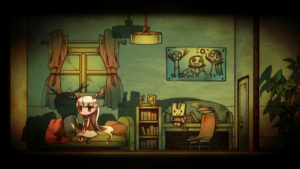 Hotaru no nikki, stylized as htoL#NiQ, follows the tale of little Mion and her firefly companions. First impressions make the game appear to be a light hearted story following a slightly troubled girl, but initial notions of what the game is about aren’t everything they seem to be in The Firefly Diary. The music of Nippon Ichi‘s newest puzzle game is tranquil, so much that the environment initially feels so peaceful it’s hard to imagine the game progressing in the direction it eventually takes. While smitten within the first few moments of my experience with The Firefly Diary, it didn’t take long for my sentiments toward it to change. Your first time leading Mion to her demise is jarring. The death screen was so unexpectedly harsh in this setting that even it feels out of place. 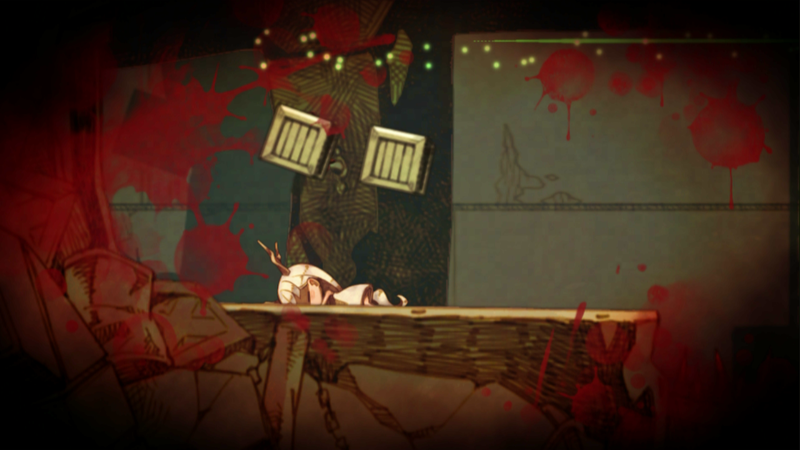 Blood spatters on the screen, Mion falls, and you’re suddenly starting the puzzle over again. So, The Firefly Diary is not the serene experience I thought I was signing up for, and that’s fine. The somber story of Mion and her companion was interesting enough. Collecting her memories to piece together just who she was became something I sincerely looked forward to, but offered little relief from the cumbersome journey. Puzzle games can be frustrating enough, but rewarding upon finally putting together the pieces. There’s a thin line somewhere between gratifying brain teaser and needlessly frustrating. The Firefly Diary definitely dives into needlessly frustrating territory and stays there most of the time. The game is advertised a puzzle platformer that makes use of the Vita’s touchscreen capabilities. I was aware of the ability to change control settings to use the face buttons and analog stick, but I wanted to try and stick with what I assumed to be the developer’s intent. That route was definitely a painful one that I regret. My journey with the touchscreen controls only lasted until chapter two’s boss. After seeing Mion die for what felt like the hundredth time, I had to switch my controls. The rear pad was so unresponsive I was convinced my Vita’s touchscreen was broken (a quick test with Project Diva confirmed my system was just fine). Progression seemed impossible while trying to switch between the light and dark world Mion traveled with my default setup. However I finally defeated the boss on my first try with a quick control change, and kept them that way for the rest of my time with the game. The Firefly Diary’s touchscreen controls just aren’t worth mentioning, and feel absolutely pointless when there’s a much less frustrating alternative. Nothing to see there, folks. It’s yet another game that can’t seem to function properly with the Vita touchscreen, do yourself a favor and switch from the default controls as soon as the game starts. Exploiting weaknesses in the enviroment to protect Mion did make for some engaging puzzles. Trial and error is yet another difficult factor to balance in the scheme of a puzzle game, and The Firefly Diary seems to do it much better when using controller settings that respond as expected. Unraveling the details of Mion’s life redeems some faults, but clumsy design in a game so unforgiving made some portions of my adventure simply joyless. The Firefly Diary was certainly a surprise. Never from my first impressions would I have expected the game that I played. It’s a shame the puzzle platformer is so often hindered by poor design and controls because the story, music, and setting are absolutely stunning. If you can bear the needless frustration that plagues the title, collecting all of Mion’s memories does make for a satisfying end. Make sure you have a few tissues handy, if you can make it that far. 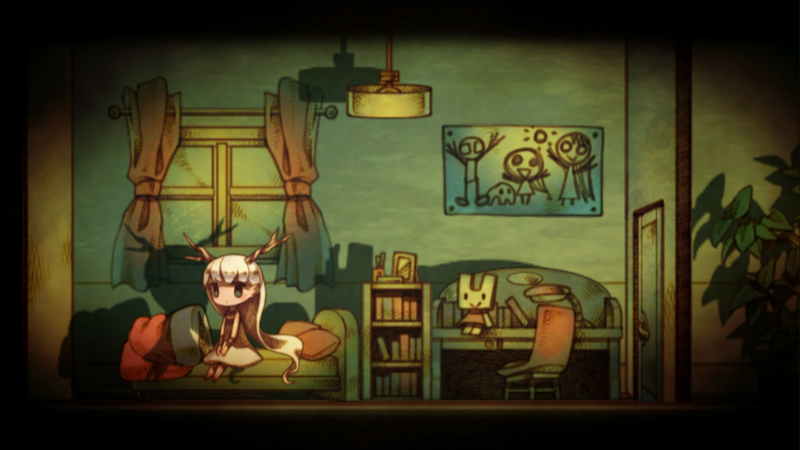 htoL#NiQ: The Firefly Diary was developed and published by Nippon Ichi Software exclusively for the PlayStation Vita. It is currently available in North America, and releases March 5 in Europe. A digital copy of the game was provided to Save/Continue for review purposes.